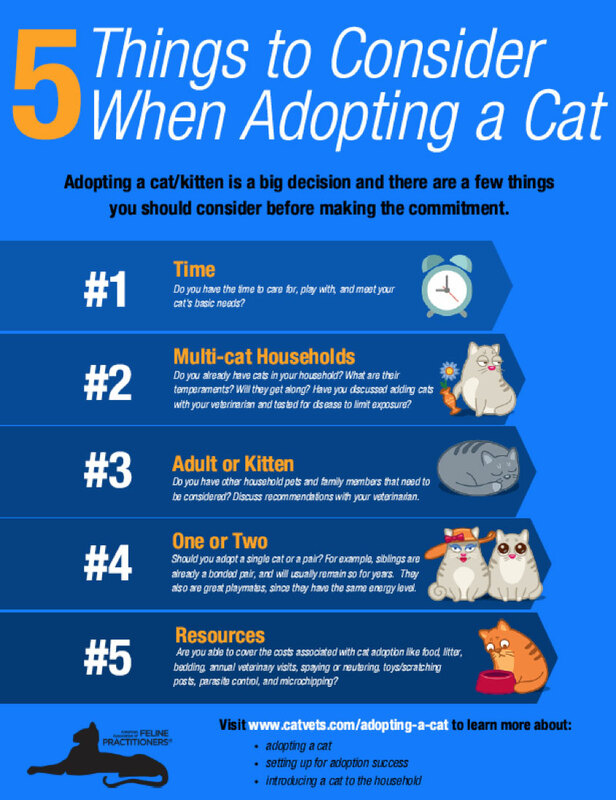 Below are important suggestions to get you off to a good start with your new kitty whether you have a multi- or single-cat household. Patience is critically important when you bring your new cat home. It is necessary both when you choose your new kitten or cat, and when you introduce your new cat to other pets and family members. Both take time, and taking the time can make all the difference in having a successful integration into your home. Planning should start before bringing home your new feline friend. The goal is to ensure that your new cat/kitten, as well as any existing cats, have their needs met. Cats are territorial, so if you already have a cat, the space in your home is the territory of your existing cat. That means that she will want to protect it from any new cats. Therefore, it is important in the beginning to create a safe space for each cat in your household. 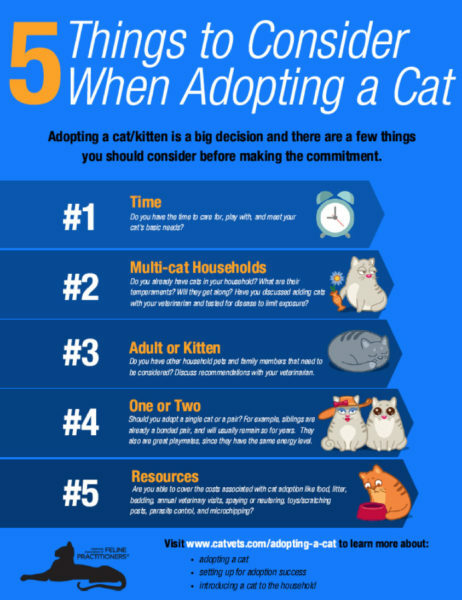 You should plan to to confine your newly adopted cat to a room or separate floor that is not the favorite area of any existing cats. It is preferable if this space has a door to prevent visual access to each other. Choose an area for your new cat where you are willing to keep perches, cat beds, litter boxes, food/water, and other resources on a long-term basis in case your cats don’t like each other. Remember that as with people, cats choose their own friends, or social groups. Even if our intentions are good, we must recognize that our cats may not like the company of another cat. Drawing a simplified floor plan of your home can help you identify how to separate your cats. Remember that each cat needs safe places to rest, hide, perch, eat and drink, and to toilet. 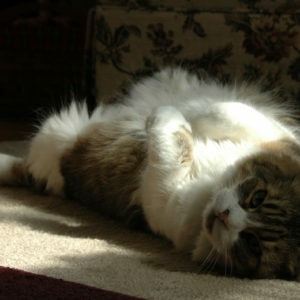 Scratching is normal behavior and cats also need scratching posts either separate or combined with a cat tree. Cats are very sensitive to smells, especially unfamiliar smells. They mark their territory with their scent to make it feel safe through cheek rubbing, scratching, and occasionally spraying. Consider using pheromone diffusers in your home to help prevent unwanted spraying, and to keep your cats more comfortable in the environment. Ask your veterinarian where to purchase a diffuser. Last, but absolutely not least, take your new cat to the veterinarian before bringing them into your home. Also make sure any existing cats are updated on their veterinary care. An apparently healthy cat that is adopted can still introduce illnesses to the existing cats! If an existing cat is already mildly ill, your new cat may cause stress that will exacerbate the illness. If you do not have a veterinarian, you can search for an AAFP Member or Cat Friendly Practice® in your area. Cat Friendly Practices have made changes to decrease stress and provide a more calming environment for cats. Their staff have also been trained in feline-friendly handling and understanding cat behavior in order to increase the quality of care for your cat. Take the introduction process slowly. If you don’t rush the introduction period, there is a great chance of your cats either liking each other or at least “time-sharing,” (moving around the entire home comfortably even if they don’t love each other). What does cat “love” look like exactly? Grooming one another, sleeping in close contact, and any other physical contact. If you have any specific questions regarding adoption, please contact your veterinarian. 1. Shore ER. Returning a recently adopted companion animal: adopters’ reasons for and reactions to the failed adoption experience. J Applied Anim Welfare Sci. 2005;8:187–198.